Thank you to all that have come to take a ride with us! We look forward to seeing you at our next event...Check our schedule below! Summer is here and we are ready to fly! The air show season is beginning and we are excited! Here's a list of our upcoming air show schedule. We are ready and prepared for the 2019 season, and as always are excited for Oshkosh 2019! Our Twin Beech is available to fly anyone over to arrive in style at Oshkosh this year and every year, please contact us for more details if you are interested. Otherwise, look out for the Stockton Field Aviation Museum's PV-2D Harpoon at one of the many air shows this year! Any questions, please give us a call! (209) 982-0273. We are getting ready for the 2005 air show season. The B-25 and the Beech will be going down for their inspections in February in preparation for another busy flying year. We are taking reservations for our annual Oshkosh trip in the B-25. This year will be extra special as we are going with two B-25s in close formation all the way across the country. We have 10 openings for crew members (5 in each plane) who will be able to swap seats between the two bombers at fuel stops across the country. This will be the most exciting Oshkosh trip yet! Call to reserve a seat as they will be going quick. September 11, 2004 The B-25 will be at Modesto for the CAF dinner dance. 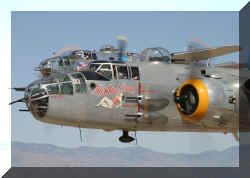 September 15th through the 19th the B-25 will be at the Reno Air Races. Three seats are still available in the B-25 so if you want to arrive in style, call for details. We will have the best view of the races from the top of the B-25. We recently attended the Pacific Coast Dream Machines show in Half Moon Bay. This was our first show of the season for the RC-45J and we were selling rides on Sunday. We had a record day and flew 24 rides. Combined with two B-25 flights and traveling to and from the show the I made 28 take off and landings. It was a long day! Thanks to all of you who came out to the show and took a ride with us. Air show season has arrived. We have been to several shows and events so far the first of which was the 62nd annual Doolittle Raider reunion in Tucson, Arizona. We departed Stockton and headed to Rialto to meet up with Bill Klaers and his wonderful crew in their B-25 In the Mood. We took off and joined up in a 2 ship of B-25's and circled over Banning awaiting the arrival of Tony Ritzman in the Pacific Princess. What an amazing sight to be in formation with two other B-25's! We were off to Falcon Field to meet with one other B-25, Martha Jean owned and flown by Dave Wheaton, and the CAF's B-17 Sentimental Journey. After a briefing we took off and joined up on the B-17 for the short trip to Tucson. If the sight of two other B-25's in formation was impressive, imagine being on the right wing of a formation of one B-17 and four B-25's. Life is good! The formation circled around Tucson and then made a pass over Tucson International where the Raiders and their family were waiting. The B-17 pulled out and the four B-25's joined up in a finger four for the missing man formation. Dave Wheaton was carrying the Raiders Goblets in Martha Jean and he pulled up as the missing man. We followed shortly after as all of the B-25's broke right for landing. Soon after we shut down the ceremonies for the reunion began. It was a real honor to meet these true heroes from our greatest generation. We were also honored to be able to fly some of the sons, daughters and grandkids of the raiders on a flight around the airport where we made some passes down the runway. This trip was made possible by the generosity of several people who were kind enough to help sponsor Old Glory. John Ward and I would like to thank you for all of your help. Col. Bob Wood was the mastermind behind our attendance. Here Bob is pinning his US Navy wings on Jimmy's beautiful wife Linda. Watch out Jimmy, Bob has that look in his eye again! We also want to thank Bill Klaers for all of his great help. Yes Bill, I owe you heavy!